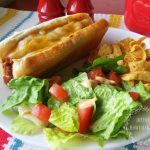 We don’t eat a lot of hot dogs at our house, since I think most other foods tend to be more nutritious, BUT when we get a hankering for one, I try to find a high quality option, and then just enjoy them! 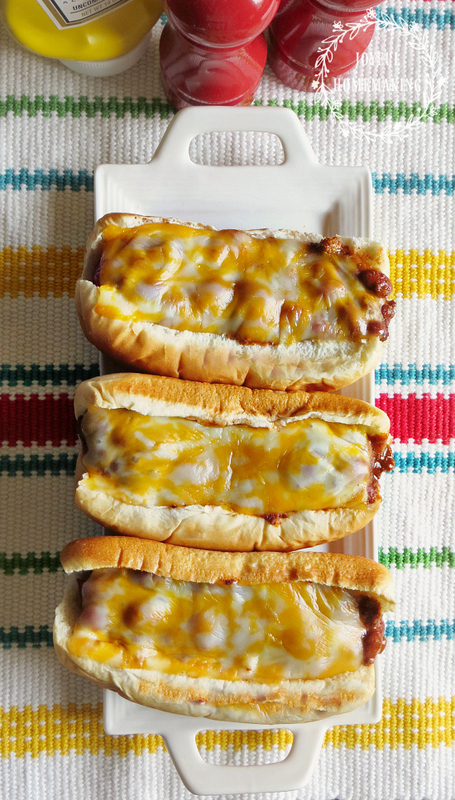 Let me tell you, topping them with chili and cheese is a way to thoroughly enjoy them! It also makes for a quick, hearty and delicious dinner option! 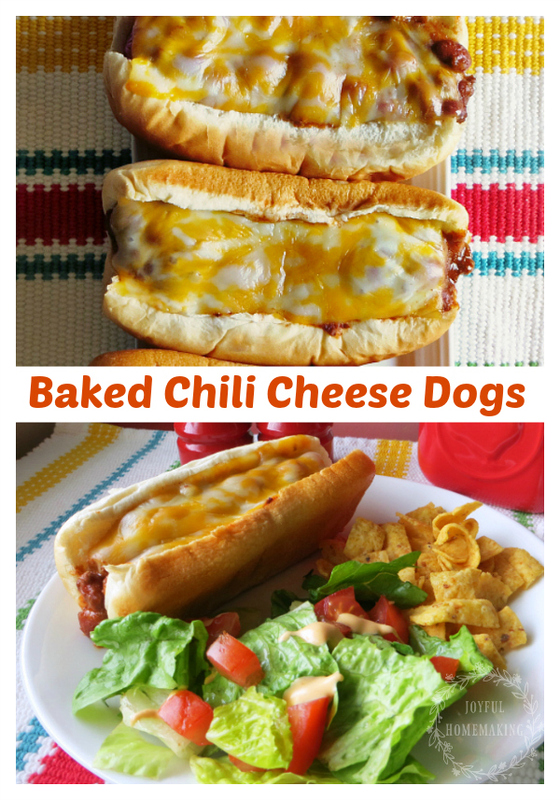 I’m not giving exact amounts, because it really depends on the amount of people you’re serving, and your preferences as to how much chili and cheese you like on your hot dogs. 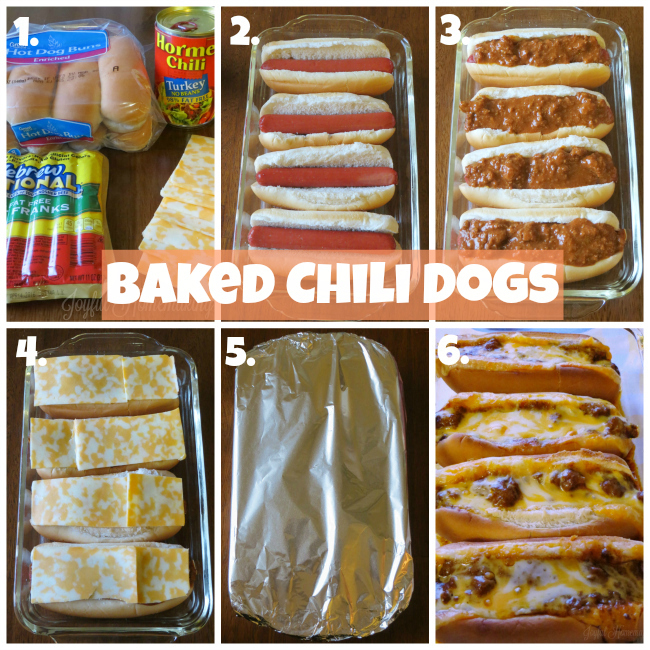 Put one hot dog in each bun and line them up in a baking dish (I like to poke a few holes in the hot dogs with a fork or knife to help the heat evenly distribute). Top with a couple of Tablespoons of chili, or more as desired. Then top with shredded or sliced cheese. Cover with aluminum foil (If the foil is touching the cheese, I like to spray the inside of the foil with cooking spray so it won’t stick), and bake in a preheated 350 degree oven for 35 minutes. Then I prefer to remove the foil and broil under the broiler for a minute or two, to get the cheese all bubbly, and the tops of the buns a little crispy! Make sure to watch them carefully while broiling so they don’t burn. 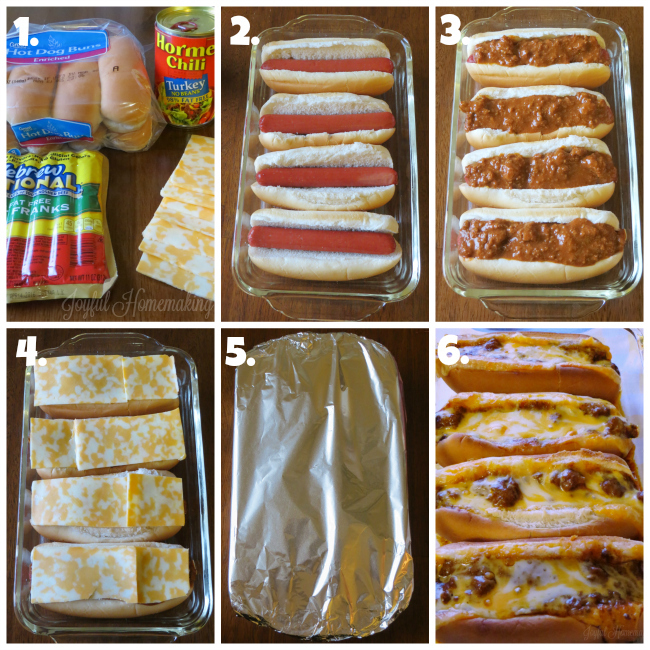 Put one hot dog in each bun and line them up in a baking dish (I like to poke a few holes in the hot dogs with a fork or knife to help the heat evenly distribute). Top with a couple of Tablespoons of chili, or more as desired. Then top with shredded or sliced cheese. Cover with aluminum foil (If the foil is touching the cheese, I like to spray the inside of the foil with cooking spray so it won’t stick), and bake in a preheated 350 degree oven for 35 minutes. Then I prefer to remove the foil and broil under the broiler for a minute or two, to get the cheese all bubbly, and the tops of the buns a little crispy! Make sure to watch them carefully while broiling so they don't burn. Serve with your family’s favorite toppings! 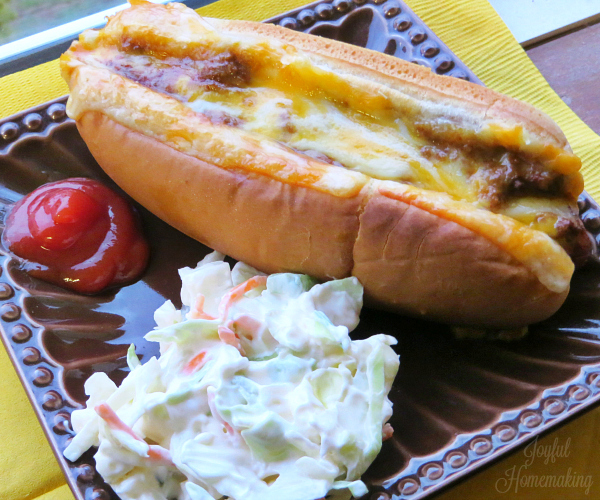 Some of my family’s favorite toppings are coleslaw, onions, relish and mustard. 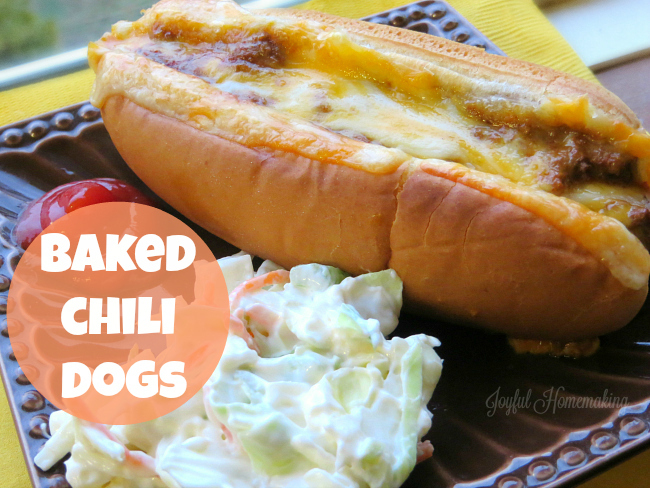 If you’ve never tried a baked chili cheese dog, you’re in for a real treat! These look delish! 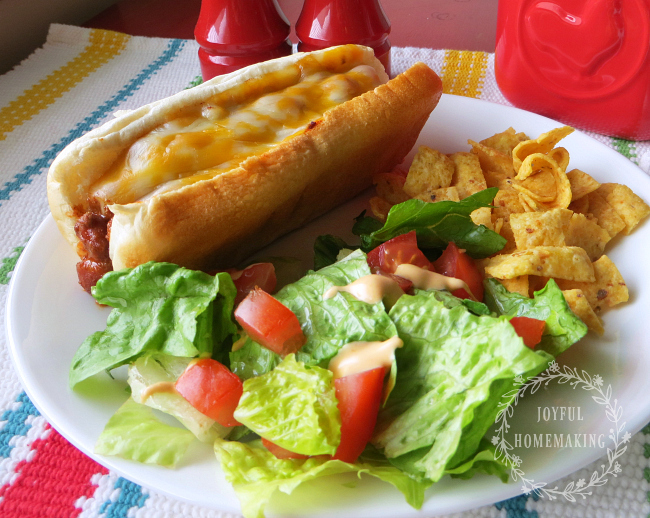 We don’t often cook hot dogs, either, but when you have a craving for one, nothing else will do! I make homemade turkey chili I found on Plain Chicken’s blog. And that cheese – YUM. Thank you for making the recipe card so easy to print. Can’t wait to try these look great.